Celebrating the life of Hugo C. Hesse, Jr.
Be the first to share your favorite memory, photo or story of Hugo. This memorial page is dedicated for family, friends and future generations to celebrate the life of their loved one. 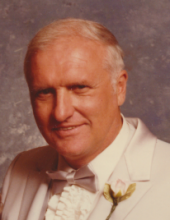 Obituary for Hugo C. Hesse, Jr.
Hugo C. Hesse, Jr. passed away Friday January 18, 2019 in Royal Oak, Michigan. He was born March 5, 1933 in Detroit, Michigan to Nora and Hugo C. Hesse, Sr. He married the late Doneen J. Hesse December 28, 1957 and they were happily married for 60 years. Hugo was the loving father of Hugo C. Hesse III, Marc Hesse, Eric Hesse, Kurt (Zdenka) Hesse, Scott Hesse, and Dawn Hesse; caring brother of Peter (Mary) Hesse , Patricia (Hans) Goede, Mary Barbara (Mike) Whiting, and the late Rosemary Hefferan.Grandfather to 14 grandchildren; and great grandfather to 4 great grandchildren. Hugo served our country as a paratrooper instructor in the United States Army Airborne division during the Korean Conflict. He later owned and operated Detroit Cornice and Slate, founded by his grandfather in 1888 until his retirement in 1991. The family will receive friends Friday, January 25, from 6 PM until 9 PM at Sawyer-Fuller Funeral Home (on 12 Mile two blocks west of Woodward). Funeral services will be held Saturday January 26 at 11 AM at the funeral home. Burial will follow at Roseland Park cemetery. To send flowers or a remembrance gift to the family of Hugo C. Hesse, Jr., please visit our Tribute Store. "Email Address" would like to share the life celebration of Hugo C. Hesse, Jr.. Click on the "link" to go to share a favorite memory or leave a condolence message for the family.